Provides information to the public on important public policy issues through forums and well researched studies. Serves Minnesota voters by sponsoring candidate debates; organizing voter registration and get-out-the-vote drives and publishing Voter Guides. Publishes information and sponsors conferences to inform the public about how government works. Through monitoring, public meetings and publications, the League of Women Voters Minnesota Education Fund initiates discussions of public policy issues that begin the process of change within communities. Thousands of Minnesotans have benefited from League of Women Voters Minnesota (LWV Minnesota) projects. Our elementary and secondary school curricula in English and Spanish, which teach the privileges and responsibilities of citizenship, are available for all Minnesota schools. We reach over 1,000,000 Minnesotans through our debates, Voter Guides and election services. The Education Fund serves Minnesota citizens of all ages. League of Women Voters Minnesota Education Fund never supports or opposes political parties or candidates. It is never used to lobby or influence legislation. This is a separate entity from League of Women Voters Minnesota which does work to influence legislation. Funding and SupportLeague of Women Voters of Minnesota Education Fund (LWV Minnesota Education Fund) is a 501(c)(3) organization under the Internal Revenue code. League Position on the Federal Role in Public Education (NEW)The LWVUS now has a position on the Federal Role in Public Education! 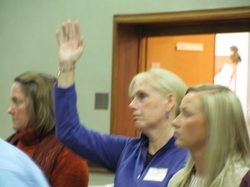 The LWVUS Board approved a new Education position at its March 2012 meeting. The position is based on responses received from the 377 Leagues across the country that participated in the Education Study. The position states that &ldquo;the League of Women Voters believes that the federal government shares with other levels of government the responsibility to provide an equitable, quality public education for all children pre-K through grade 12. A quality public education is essential for a strong, viable and sustainable democratic society and is a civil right.&rdquo; Thanks to the many local and state Leagues and ILOs that held meetings, involved their communities, and worked to reach consensus on this critical issue of importance to all Americans. Committee Chairs Peggy Hill (TX) and Joanne Leavitt (CA) and their Committee: Pat Aaron ( IL), Carolyn Jefferson-Jenkins (CO), Patricia Libutti (NJ), Sanford Ostroy (MA), Jean Pierce (IL) and Janelle Rivers (SC) are to be commended for their excellent work and leadership. The LWVUS Board approved a new Education position at the March 2012 (March 25, 2012) Board meeting. The position is based on responses received from the 377 Leagues across the country who participated in the Education Study. Thanks to the many local and state Leagues and ILOs who held meetings, involved their communities and worked to reach consensus on this critical issue of importance to all Americans. Committee Chairs Peg Hill (TX) and Joanne Leavitt (CA) and their committee: Pat Aaron ( IL), Carolyn Jefferson-Jenkins (CO), Patricia Libutti (NJ), Sanford Ostroy (MA), Jean Pierce (IL) and Janelle Rivers (SC) are to be commended for their excellent work and leadership. The League of Women Voters believes that the federal government shares with other levels of government the responsibility to provide an equitable, quality public education for all children pre-K through grade 12. A quality public education is essential for a strong, viable, and sustainable democratic society and is a civil right. Provide a combination of competitive grants and non-competitive funding to states and local school districts to achieve equity among states and populations. Mechanisms for local and state funding with adequate federal support for mandates that require less burdensome, compliance-based reporting and regulations. The League of Women Voters believes a basic role of the federal government in funding education should be to achieve equity among states and populations on the basis of identified needs. This should be done with full understanding that equity does not mean equal, given that some populations are more expensive to educate than others and some localities have specific needs. Access to health care needs (i.e., hearing, vision, dental, immunization, school-based health clinics at the secondary level, etc.) and nutritionally adequate food (i.e., school-based meals under “free and reduced meal programs”). Research that demonstrates the importance of linking state and local community partnerships with effective early childhood education programs and services.